For basic tips on using images online, please see our blog, Image Basics for Bloggers, from last week. In the past, buying photography was expensive and complicated. Royalties needed to be paid and photos were limited to many restrictions on how they could be used. Then along came Creative Commons in 2001, and everything changed. This non-profit corporation started with a cooperative effort between MIT and Harvard Law professors (among others) who realized that the digital revolution altered many past concepts on copyright theory. The ability to work collaboratively, globally, decentralized and create derivative works and collections that were low to no cost were all issues that were eased with the creation of Creative Commons licensing. 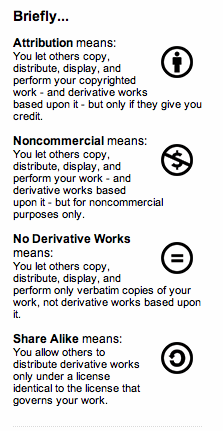 Click on the following link for more information on Creative Commons licensing. How do I use a Creative Commons image? Things are much easier today in the world of social media and inbound marketing. How do you know if it’s legal and IF you’re placing it correctly? Be sure the image you choose and the way you are using it, applies under the Creative Commons license category shown to the right. If using a link, HTML or BBCode, review the code to be sure the contributor’s name is included. Link back to them when you can. How do I find Creative Commons images? What do you need to do to add photos into your blog or website with little to no cost, legally? Here are a few suggestions. Google Images offers an “Advanced Image Search” (found just to the right of the standard Google Image search button) that allows you to use images “labeled for commercial use” only. Just click on the blue link and a window similar to this Google image appears. In a search for ‘pens’ you enter the word in the top field and make sure the “labeled for commercial use” is chosen in the field second from the bottom. Membership is not required. Attribution is required. Flickr has a nice interface for Creative Commons. You choose the level that works for you depending on if you blog to earn money or just for fun. 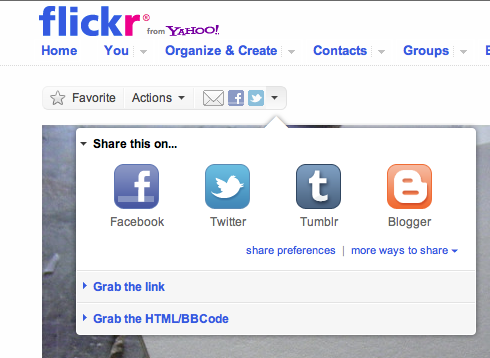 To use an image in Flickr, you click on the bar above the image, as shown in this Flickr image, and grab the Link or HTML/BBCode. The problem with this is that the image is not physically loaded into your site, it’s called ‘hot-linked’ and means it is ‘linked’ to your site through the Internet and does not sit on your directly-accessible servers. Test it to see if your page takes too long to load. Membership is required. Attribution is required. With all that said, THIS ONE GETS MY VOTE… Wylio.com! Wylio is a slick, new image search engine that only searches for images offered under the Creative Common’s license. Users can be sure that all images offered are free for use. It’s a simple 3-step process: Search for an image, Resize and Position, and Copy and Paste the Code. Bloggers can easily grab the code to place in their blog posts, or for the low cost of $2.99 per month they can buy the premium version of Wylio.com and download the files. Here’s the best part. Wylio inserts the photographer’s attribution into the code for you, no asking for permission, no wondering if you’re ‘covered’. Grab it and you’re done! With that said, I am testing this ‘hot-linking method’ today for download speeds and performance. Let me know, in the comments section below, if the pen image gives you any trouble. It is a ‘live’ test from Wylio.com. Join the conversation on Twitter. How do you use images? Have you worried about your images? Still need some help? Give us a call! I’ve been looking for something like this! Now finding images I can actually use on my blog is easy and not a pain in the neck! Thanks!